UMUAHIA, Nigeria—Six months after the raid, the house still lies in shambles. Its walls are pocked with bullet holes, clothes are strewn about the grounds, and the windshields of the cars on the property are shattered. 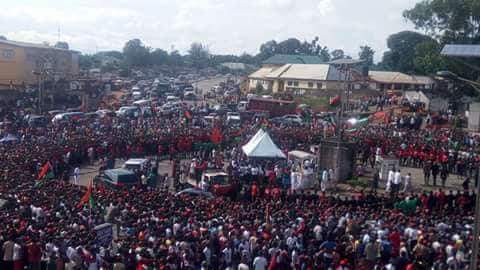 Located in the city of Umuahia, the capital of Abia state in southeast Nigeria, the house belongs to the family of Nnamdi Kanu, leader of the Indigenous People of Biafra, or IPOB, a group that wants this corner of the country to form a breakaway nation dominated by members of the Igbo ethnic group. On the morning of Sept. 14, Kanu and other members of his family were sitting at home, witnesses say, when a detachment of Nigerian soldiers stormed the compound, shooting automatic weapons indiscriminately into the air. The IPOB says more than 20 of its members either were killed during the attack or disappeared after it. Kanu himself has not been seen or heard from since. Foreign governments and human rights organizations seem similarly skeptical of Nigerian officials’ denials. Kanu holds British citizenship, and the U.K. High Commission in Nigeria has said it is pressing the state for information about him. Amnesty International, meanwhile, has said it is investigating the reported deaths of IPOB members while cautioning soldiers against the use of brute force on unarmed civilians. The organization’s past reporting suggests it would hardly be out of character for Nigerian security forces to have killed Kanu. In November 2016, Amnesty documented a “chilling crackdown” in the southeast that included the killing of more than 150 pro-Biafra activists—allegations that were also disputed by the military and police. Whatever the various ongoing investigations reveal, the incident in Umuahia and its fallout are a grim display of the growing acrimony between the central government in Abuja and separatists in the southeast. Though such tensions go at least as far back as the devastating Nigerian Civil War, which lasted from 1967 to 1970 and resulted in more than 1 million deaths, they have escalated sharply since 2013, when Kanu ramped up calls for the establishment of an independent Republic of Biafra and security forces retaliated with heavy-handed, and frequently brutal, tactics. The state’s handling of the Biafra crisis continues a long tradition in which Nigerian authorities aggravate, rather than ease, the grievances of marginalized groups. If it turns out that Nnamdi Kanu was in fact killed, large-scale protests would be virtually guaranteed, along with future election boycotts and, potentially, reprisal violence. But even if he turns up alive, the government’s problems in the region would be far from over. Its handling of the Biafra crisis continues a long tradition in which the state has aggravated rather than eased the grievances of marginalized Nigerians. More broadly, as Kanu’s disappearance shows, there is a widening gulf between the government’s claims about nationwide security gains and the reality on the ground. From the Boko Haram insurgency in the north to clashes between herders and farmers in the Middle Belt region to separatist tensions in the southeast, the government of President Muhammadu Buhari seems to be bouncing from one flashpoint to the next. The picture ahead of general elections scheduled for February 2019 is bleak, especially given Nigeria’s past track record of election-related violence. The name Biafra is believed to derive from two Igbo words: bia, meaning come, and fara, meaning live. The town of Umuahia has long played an important role in efforts to bring the Republic of Biafra into existence. Fifty years before the raid on the Kanu family home, in September 1967, the town was declared the capital of the breakaway state. The civil war, commonly known as the Biafran War, had begun several months earlier, and rebels made Umuahia their seat of power after government troops overran the first Biafran capital, Enugu. The independence movement caught fire around the middle of the decade, led by Igbo leaders angered by a perceived pattern of abuses against the Igbo population in the north. In January 1966, a military coup spearheaded by two Igbo officers toppled the government of Prime Minister Abubakar Tafaw Balewa. The putsch led to the assassination of several of the country’s prominent leaders—though not Nnamdi Azikiwe, the ethnic Igbo who served as the first president of Nigeria, as he was conveniently out of the country at the time. Six months later, an ill-advised decree by Thomas Umunnakwe Aguiyi-Ironsi, an Igbo who became head of state after the coup, did away with the existing system of regional autonomy. In response to that as well as the seeming lack of will to prosecute the coup-plotters, a group of officers from northern Nigeria carried out another coup to counter what they suspected was a power-grabbing conspiracy by Igbos, who are concentrated in the southeast. This deepened tribal tensions, resulting in the killing of thousands of Igbos living in the north; many put the estimated fatalities at 30,000. Separatist sentiments in southeast Nigeria escalated considerably in the wake of that bloodshed. They were further exacerbated by disagreements over the implementation of the Aburi Accord, which was signed in 1967 by representatives of the federal government and Col. Chukwuemeka Odumegwu Ojukwu, the eastern military governor. Again, the disagreements centered on questions about the devolution of power to regional leaders. In May 1967, Ojukwu announced the creation of the Republic of Biafra, sparking the official beginning of the civil war. The territory he spoke for encompassed more than 77,000 square miles and about 13 million people. The war, which lasted for 30 months, led to the deaths of thousands of soldiers on both sides, but it is even more notorious for the civilian toll. More than 1 million Igbos died of starvation caused by a military blockade imposed by the government. Images of starving children and disease-ridden bodies sparked intense international media coverage and concern. Outgunned, outmanned and starving, the Biafran side ultimately could not hold off the offensives by the better equipped Nigerian troops, who successfully took over the region’s towns. In January 1970, the rebels surrendered and the war ended, seemingly extinguishing the vision of an independent Biafran state. In the war’s immediate aftermath, the federal government, then headed by Yakubu Gowon, declared a policy of “No Victor, No Vanquished,” ostensibly to foster reconciliation and reconstruction. However, in the eyes of many Igbos, this policy was undermined by the decision of Finance Minister Obafemi Awolowo to grant Igbos only 20 Nigerian pounds each in financial assistance, regardless of what they might have lost during the conflict. Many Igbos say their home region and people have continued to suffer from chronic neglect in the decades that followed. Apart from Alex Ekwueme, who served as vice president for a four-year period ending in 1983, no Igbos have held either of the country’s top two governing positions. Infrastructure in Nigeria’s southeast remains dilapidated and deficient, falling short of what Igbos enjoyed during the days of greater regional autonomy, when local officials allocated more resources to development projects. In Umuahia, the main attraction testifying to the town’s pivotal role in the conflict is a poorly maintained museum located in a bunker used by Ojukwu during the war. It houses a few scattered relics of the conflict years, including warships, old planes and artillery. Unimpressive though this collection may be, the period looms large in the public consciousness of the region, even if it is rarely discussed by Nigerian officials or broached in Nigerian classrooms. The son of the traditional ruler of a local autonomous ethnic community, Kanu was raised as an Igbo prince and studied in various distinguished institutions across Nigeria. He dropped out of the University of Nigeria in Enugu state to move abroad, enrolling at London Metropolitan University. During his time in the United Kingdom, he acquired British citizenship, a bachelor’s degree in political science and economics and an obsession with the Liverpool soccer club. Many Igbos say their home region has continued to suffer from chronic neglect since Nigeria’s civil war. In 2012, Kanu took over Radio Biafra, a community station based in the Peckham district of London. This came after a falling-out with his mentor and fellow secessionist, Ralph Uwazuruike, over funding and control of the secessionist machinery the men had started organizing three years earlier. Working out of his apartment, Kanu was able to reach diaspora Nigerians from Guangzhou to Houston as well as listeners in his home country. His strongly worded speeches on air and at pro-Igbo forums rattled the government. This concern increased following the World Igbo Congress in September 2015 in Los Angeles, at which Kanu issued a call to arms. “We need guns and we need bullets. We now know that the best way to defend yourself is to be armed, because Boko Haram is everywhere,” he said. Abuja repeatedly tried to block the frequencies of Radio Biafra, but the IPOB kept finding ways to get through. “Our technology is superior to that of the zoo,” Kanu wrote at one point on Facebook, mocking the administration of then-President Goodluck Jonathan. By locking Kanu up, the government transformed him into a political prisoner, inflating his influence. In April 2017, he was finally granted bail; a Nigerian senator, a businessman and a Jewish clergyman—all Igbos—came up with the payment of 100 million naira, or roughly $277,000. The bail conditions included a ban on political speech, media interviews and speeches before crowds of more than 10 people. But Kanu, whose treason case was still active, flouted them, drawing crowds of hundreds to the family compound in Umuahia and reaching thousands more via radio and social media across the region. Subsequently, Buhari met with his military chiefs, and Operation Python Dance II, a military campaign to reduce violent crime and secessionist agitations in the southeast, was conceived. It followed Operation Python Dance I, which unfolded in late 2016. Within weeks, soldiers armed with rifles were deployed to the southeast, and stories of civilians being whipped in public by troops became common in Umuahia. Then, in early September, a video emerged of Kanu telling IPOB members that it was not, in fact, Buhari who had returned from London. “The man you are looking at on the television is not Buhari. He is from Sudan,” Kanu bellowed. “His name is Jubril, he is from Sudan. After extensive plastic surgery, they brought him back. [They] taught him Buhari’s mannerisms, and he came and is deceiving all of you. You cannot deceive Nnamdi Kanu, you cannot deceive IPOB.” The claim gained significant traction, even beyond the southeast. Ten days later, Kanu’s family home was raided. Since the launch of Operation Python Dance II, the southeast has effectively become a police state. Igbos who live elsewhere in the country and who returned for Christmas celebrations last year reported being detained and harassed for hours by Nigerian soldiers conducting stop-and-search operations. If the goal of recent military operations in the southeast is to extinguish pro-Biafra sentiment, this approach does not appear to be working. Yet if the goal is to extinguish pro-Biafra sentiment, the operation does not appear to be working. On Feb. 27, IPOB members released a statement to mark the recent death of Joe Achuzia, the Biafran general who scored a major victory against federal troops in the small town of Abagana during the war. The statement praised Achuzia as someone who “most represented the spirit of bravery and patriotism” embodied by Biafran war leaders. Though Operation Python Dance II ended in October, tension in the area is still high and Kanu’s disappearance remains a point of fascination for residents of Umuahia. Rumors of his whereabouts abound. There have been reported sightings in neighboring Ghana as well as in London, prompting claims by government officials and others that Kanu abandoned the cause of Biafra to save his own skin. Regardless of whether this happens, it is clear that many Igbos, convinced that their interests will never be effectively represented by Nigeria’s, will continue to clamor for a nation of their own. Making matters worse, there is little reason to expect Buhari’s administration can effectively defuse anti-government sentiment. To the contrary, Nigerian authorities have, over the years, perfected the art of ignoring or crushing, rather than appeasing, angry constituencies. If the past offers any clues, this approach could yield devastating consequences in the southeast. In the most glaring example, military abuses against Boko Haram’s leaders in the late 2000s, including the killing of Mohammed Yusuf, are widely blamed for fanning the flames of an insurgency that has now killed more than 20,000 people. In the best-case scenario, lessons from that experience would inform the actions of the government and military in the southeast going forward. The worst-case scenario is a return to the violence of the 1960s, and another black mark for a president who came to power promising to restore peace in Nigeria. Eromo Egbejule is a journalist covering conflict, culture, politics and their intersections with history, technology and everyday life across West Africa. He is currently based in Lagos, Nigeria. His work has been published by outlets including The Washington Post, The Guardian and Reuters. Follow him on Twitter: @EromoEgbejule.